(Kansas City, Mo. 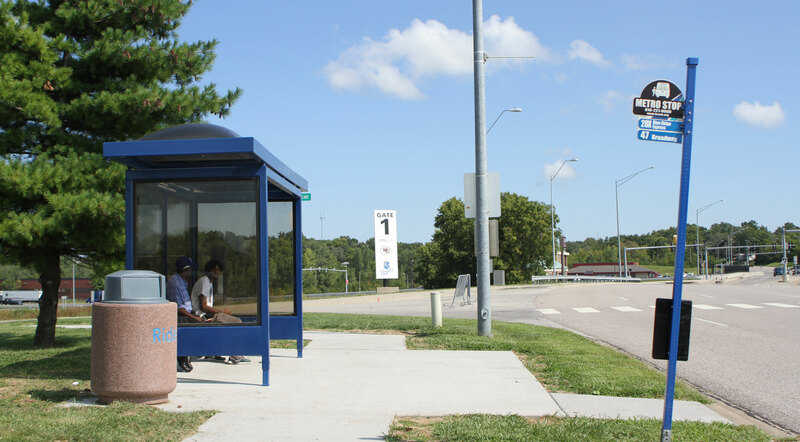 – Sept. 11, 2017) The bus stop at Kauffman Stadium and Arrowhead has had an extreme makeover, thanks to a joint effort by the Jackson County Sports Complex Authority (JCSCA) and the KCATA. 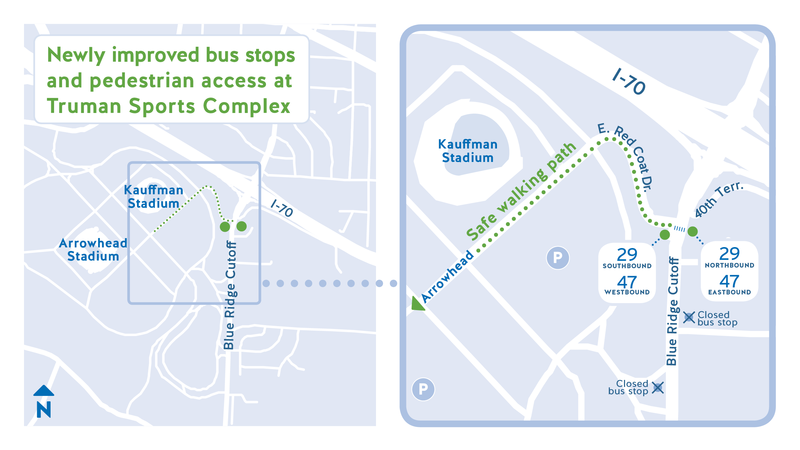 To celebrate the improvement, KCATA will host a tailgate for transit customers and stadium employees from 10 a.m. to 1 p.m. Wednesday, Sept. 13, 2017, at the new bus stop. The Royals take on the White Sox at 1:15 p.m. that day. Dignitaries will be available from 10 to 10:30 a.m. In 2016, the stop was a finalist for the title of “America’s Sorriest Bus Stop” in Streetsblog USA’s annual tournament. The area of Blue Ridge around the Sports Complex previously had no sidewalks. The stop on southbound Blue Ridge Cutoff was essentially a patch of dirt with a sign indicating it was a bus stop, but there was no concrete or other amenities. Now, getting on and off the bus is a safer, more pleasant experience. The stop moved north approximately 500 feet, near the Missouri Welcome Center at 4010 Blue Ridge Cutoff. The JCSCA built a sidewalk from the new stop into the stadium complex, as well as a paved platform for the bus stop. KCATA also added a bench and shelter to the stop. The Sports Complex Authority is adding sidewalks throughout the stadium complex. Kauffman Stadium is served seven days a week by the 47 Broadway. 28X Blue Ridge Express also travels to the Blue Ridge Cutoff stop, but with less frequent service and only during rush hours. Below: Employees and visitors at the Sports Complex enjoy the new amenities.